Freshly plastered pool still has it’s diving board! Paradise Palms was the first master planned community in Las Vegas. In the early 60’s, it was “way out in the desert! 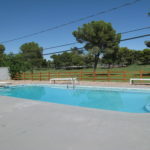 Of course now – it’s perfectly situated only minutes from the Strip, UNLV, and Downtown. In the near future – the Spencer Street power line easement will become part of the bicycle/walking trail system that will connect UNLV to Downtown Las Vegas. 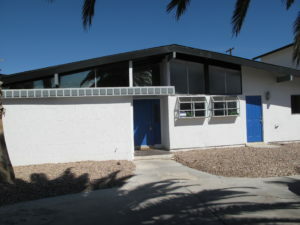 There’s a lot of Mid Century Modern homes in Las Vegas, but the highest concentration can be found in Paradise Palms. The designs of famed architect Bill Krisel, who recently passed away, can be found in many communities in California, but the only place where his designs can be found in Nevada are in Paradise Palms. The main house is 3 bedrooms and 2 baths with vaulted ceilings and clerestory window!